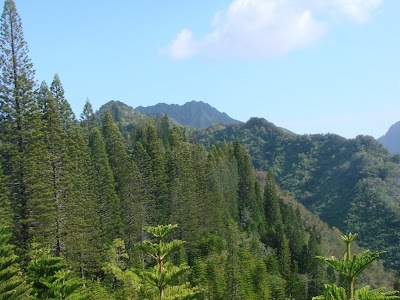 Continuing along the Kapalama Loop Trail we came across this incredible view of the mountains which makes me feel lucky to live in Hawaii. 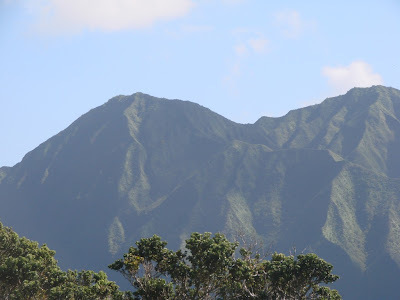 This is the view people fly to Hawaii to see… well this and the beach view. There are also views of the city but due to the volcanic haze in the air it wasn’t that clear but these mountains were just at the right location to avoid most of the haze. Hope everybody has a great weekend and see you in March. Here is what the typical trail looks like on the Kapama Loop hike. As you can see by this and yesterdays pictures there are plenty trees. The trail is pretty strenous as there are a lot of up and downs and it does lead to some great views though this day it was a bit hazy but we will see that in the days to come. Thanks for allowing a short break with Las Vegas but now we move back to Hawaii since after all this is the Hawaii Photo of the Day. 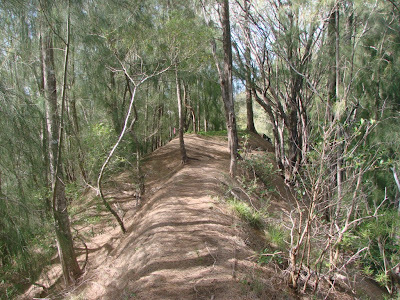 Today we look at the treeline on the Kapalama Loop trail. I angled the shot to get the various pine trees with the mountains it he background. The hike is a 5 mile loop and in the coming days we will take a look at some other pictures along the way.